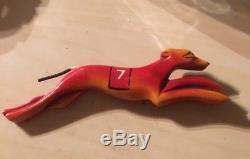 Vintage 1940's Over Dyed Bakelite Greyhound Pin Brooch. It measures 4 1/2" wide and 1 1/4" high. The item "VINTAGE 1940'S OVER DYED BAKELITE GREYHOUND PIN BROOCH" is in sale since Wednesday, January 23, 2019. This item is in the category "Jewelry & Watches\Vintage & Antique Jewelry\Costume\Bakelite, Vintage Plastics\Pins, Brooches". The seller is "jewelfever2015" and is located in Roma. This item can be shipped worldwide.